Great to see the state of the art being advanced on so many fronts! A topic that I have been interested in for a long time is forecasting mortality rates, perhaps because this is one of the interesting intersections of statistics and these days, machine learning, and the field of actuarial science in life insurance. Several methods to model mortality rates over time have been proposed, ranging from the relatively simple method of extrapolating mortality rates directly using time series, to more complicated statistical approaches. where mx,t is the force of mortality at age x in year t, ax is average log mortality rate during the period at age x, κt is the time index in year in year t and bx is the rate of change of log mortality with respect to the time index at age x. How are these quantities derived? There are two methods prominent in the literature – applying Principal Components Analysis, or Generalized Non-linear Models, which are different from GLMs in the sense that the user can specify non-additive relationship between two or more terms. To forecast mortality, models are first fit to historical mortality data and the coefficients (in the case of the Lee- Carter model, the vector κ) are then forecast using a time series model, in a second step. In the current age of big data, relatively high quality mortality data spanning an extended period are available for many countries from the excellent Human Mortality Database, which is a resource that anyone with an interest in the study of mortality can benefit from. Other interesting sources are databases containing sub-national rates for the USA, Japan and Canada. The challenge, though, is how to model all of these data simultaneously to improve mortality forecasts? While some extensions of basic models like the Lee-Carter model have been proposed, these rely on assumptions that might not necessarily be applicable in the case of large scale mortality forecasting. For example, some of the common multi-population mortality models rely on the assumption of a common mortality trend for all countries, which is likely not the case. We use a deep network, in other words the network consists of multiple layers of variables that expresses the prior that complex features can be represented by a hierarchy of simpler representations learned in the model. Instead of using one-hot encoding to signify to the network when we are modelling a particular country, or gender, we use embedding layers. When applied to many categories, one-hot encoding produces a high-dimensional feature vector that is sparse (i.e. many of the entries are zero), leading to potential difficulties in fitting a model as there might not be enough data to derive credible estimates for each category. Even if there is enough data, as in our case of mortality rates, each parameter is learned in isolation, and the estimated parameters do not share information, unless the modeller explicitly chooses to use something like credibility or mixed models. The insight of Bengio et al. (2003) to solve these problems is that categorical data can successfully be encoded into low dimensional, dense numerical vectors, so, for example, in our model, country is encoded into a five-dimensional vector. In the paper, we also show how the original Lee-Carter model can be expressed as a neural network with embeddings! In the paper, we also employ one of the most interesting techniques to emerge from the computer vision literature in the past several years. 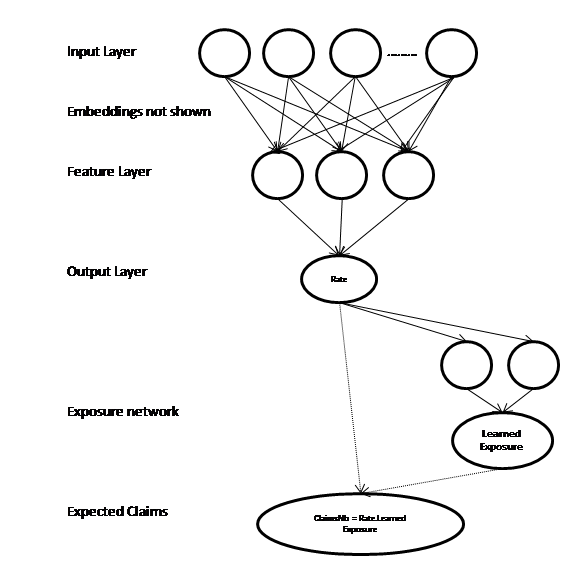 The original insight is due to the authors of the ResNet paper, who analysed the well-known problem that it is often difficult to train deep neural networks. They considered that a deep neural network should be no more difficult to train than a shallow network, since the deeper layers could simply learn the identity function, and thus be equivalent to a shallow network. Without going too far off track into these details, their solution is simple – add skip layers that connect the deep layers to more shallow layers in the network. This idea is expanded on in the DenseNet architectures. We simply added a connection between the feature layer, and the fifth layer of the network, connecting the embedding layers almost to the deepest layer of the network. This boosted the performance of the networks considerably. We would value any feedback on the paper you might have. Bengio, Y. 2009. “Learning deep architectures for AI”, Foundations and trends® in Machine Learning 2(1):1-127. I will be speaking about deep learning and its applications to actuarial work at the 2018 ASSA Convention in Cape Town, this Thursday 25 October. Hope to see you there! I would value feedback on the paper from anyone who has time to read the paper. This post, though, is about the process of writing the paper and some of the issues I encountered. Within the confines of an academic paper it is often hard, and perhaps mostly irrelevant, to express some thoughts and opinions and in this blog post I hope to share some of these ideas that did not make it into the paper. I am not going to spend much time defining the terms too much, and if you refer to the paper if some terminology is unclear I think it will help to clarify. Within the paper I try to apply deep learning to the problem addressed in the excellent tutorial paper of Noll, Salzmann and Wüthrich (2018) which is about applying machine learning techniques to a French Motor 3rd Party Liability (MTPL) dataset. They achieve some nice performance boosts over a basic GLM with some hand engineered features using a boosted tree and a neural network. One of the biggest shocks that I had was when I decided to try this problem myself is that off the shelf tools like XGboost did not work well at all – in fact, the GLM was by far better despite the many hyper-parameter settings that I tried. I also tried out the mboost package but the dataset was too big for the 16gb of RAM on my laptop. So the first mini-conclusion is that just because you have tabular data (i.e. structured data with rows for observations and columns for variables, like in SQL), you should not automatically assume that a fancy ML approach is going to outperform a basic statistical one. Anecdotally, I am hearing from several different people that applying vanilla techniques to pricing problems doesn’t provide much performance boost. This was perhaps the most vexing part of the process. Fitting deep networks with ReLu activations to the French dataset, like the more up to date sources on deep learning seem suggest, also did not work all that well! In fact, I achieved only poor performance on a network fit to data without manual feature engineering. Another issue is that depth didn’t seem to help all that much. Similarly, naively coding up deep autoencoders for the mortality data that is also discussed in the paper turned out to be a major learning when writing the paper – these just did not converge despite the many attempts at tuning the hyperparameters. I only managed to find a decent solution using greedy unsupervised learning (Hinton and Salakhutdinov 2006) of autoencoder layers. Therefore a conclusion if you encounter a problem to which you want to apply Deep Learning – be aware that ReLus plus depth might not work and you might need to dig into the literature a bit! When DL works, it really works! This is connected to the next idea. Once I found a way of training the autoencoders, the results were fantastic and by far exceeded my expectations (and the performance of the Lee-Carter benchmark for mortality forecasting). Also, once I had the embedding layers working on the French MTPL dataset, the results were better than any other technique I could (or can) find. I was also impressed by the intuitive meaning of the learned embeddings, which I discuss in some detail in the paper, and the fact that plugging these embeddings back into the vanilla GLM resulted in a substantial performance boost. The flexibility of the neural networks that can be fit with modern software, like Keras, is almost unlimited. Below is what I call a “learned exposure” network which has a sub-network to learn an optimal exposure measure for each MTPL policy. I have not encountered a similarly flexible and powerful system in any other field of statistics or machine learning. One potential criticism of the title of the paper is that this isn’t really AI, but rather fancy regression modelling. I try to argue in Section 3 of the paper that Deep Learning is an approach to Machine Learning whereby you allow the algorithm to figure out the features that are important (instead of designing them by hand). Also, that deep nets seem to be able to perform “AI tasks” (the term used by Bengio, Courville and Vincent (2013) to mean tasks “which are challenging for current (shallow, my addition) machine learning algorithms, and involve complex but highly structured dependencies”) such as describing images indicates that something more than simple regression is happening in these models. An in joke that seems to have made the rounds is so-called “gradient descent by grad student” – in other words, it is difficult to find optimal deep learning models and one needs to fiddle around with designs and optimizers until something that works is found. This is much easier if you have a team of graduate students who can do this for you, thus the phrase quoted above. What this means in practice is that there is often no off the shelf solution, and little or no theory to guide you in what might work or not, leading to lots of experimenting with different ideas until the networks perform well. The traditional actuarial literature has not seen many contributions dealing with deep neural networks, yet. Some of the best work I found, which I highly recommend to anyone interested in this topic, is a series of papers by Mario Wüthrich and his collaborators (Gabrielli and Wüthrich 2018; Gao, Meng and Wüthrich 2018; Gao and Wüthrich 2017; Noll, Salzmann and Wüthrich 2018; Wüthrich 2018a, b; Wüthrich and Buser 2018; Wüthrich 2017). What is great about these papers is that the ideas are put on a firm mathematical basis and discussed within the context of profound traditional actuarial knowledge. I have little doubt that once these ideas take hold within the mainstream of the actuarial profession, they will have a huge impact on the practical work performed by actuaries, as well as on the insurance industry. Compared to statistical methods, though, there are still big gaps in understanding the parameter/model risk of these deep neural networks and an obvious next step is to try apply some of the techniques used for parameter risk of statistical models to deep nets. There are many excellent resources available to learn about Machine and Deep Learning that I discuss in the resources sections of the paper, and, best of all, most of these are free, except for opportunity costs. Lastly, a word about Keras , which is the high level API that makes fitting deep neural models easy. 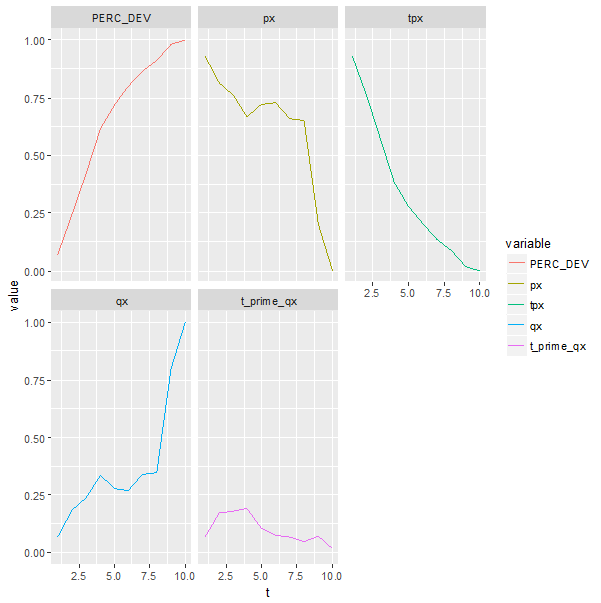 This is a phenomenally well put together package, and the R interface makes it much more accessible to actuaries who might not be familiar with Python. I highly recommend Keras to anyone interested in experimenting with these models, and, Keras will be able to handle most tasks thrown at it, as long as you don’t try anything too fancy. One thing I wanted to try, but couldn’t figure out was how to add an autoencoder layer to a supervised model where the inputs are the outputs of a previous layer, and this is one of the few examples where I ran into a limitation in Keras. Bengio, Y., A. Courville and P. Vincent. 2013. “Representation learning: A review and new perspectives”, IEEE transactions on pattern analysis and machine intelligence 35(8):1798-1828. Gabrielli, A. and M. Wüthrich. 2018. “An Individual Claims History Simulation Machine”, Risks 6(2):29. Gao, G., S. Meng and M. Wüthrich. 2018. Claims Frequency Modeling Using Telematics Car Driving Data. SSRN. https://papers.ssrn.com/sol3/papers.cfm?abstract_id=3102371. Accessed: 29 June 2018. Gao, G. and M. Wüthrich. 2017. Feature Extraction from Telematics Car Driving Heatmaps. SSRN. https://papers.ssrn.com/sol3/papers.cfm?abstract_id=3070069. Accessed: June 29 2018. Hinton, G. and R. Salakhutdinov. 2006. “Reducing the dimensionality of data with neural networks”, Science 313(5786):504-507. Mikolov, T., I. Sutskever, K. Chen, G. Corrado et al. 2013. “Distributed representations of words and phrases and their compositionality,” Paper presented at Advances in neural information processing systems. 3111-3119. Noll, A., R. Salzmann and M. Wüthrich. 2018. Case Study: French Motor Third-Party Liability Claims. SSRN. https://ssrn.com/abstract=3164764 Accessed: 17 June 2018. Wüthrich, M. 2018a. Neural networks applied to chain-ladder reserving. SSRN. https://papers.ssrn.com/sol3/papers.cfm?abstract_id=2966126. Accessed: 1 July 2018. Wüthrich, M. 2018b. v-a Heatmap Simulation Machine. https://people.math.ethz.ch/~wueth/simulation.html. Accessed: 1 July 2018. Wüthrich, M. and C. Buser. 2018. Data analytics for non-life insurance pricing. Swiss Finance Institute Research Paper. https://ssrn.com/abstract=2870308. Accessed: 17 June 2018. Wüthrich, M.V. 2017. “Covariate selection from telematics car driving data”, European Actuarial Journal 7(1):89-108. I had to get a couple more CPD hours done and the ICA 2018 conference came along at exactly the right time! This time around, a virtual option was offered and the Actuarial Society of South Africa (ASSA) organized access for all of its members – a really great move by ASSA in my opinion, and I hope that others benefited as much as I did from this intellectually stimulating event. I listened with a focus on P&C insurance (I prefer the American term, but in other jurisdictions: SA – short-term, UK – GI, Europe – non-Life), so my comments that follow don’t take account of the sessions on other actuarial areas that I have no doubt were also very worthwhile. In a previous post I advanced the view that actuarial science is not standing still as a discipline, and that comments such as “AI instead of actuaries” are short-sighted. I am glad to report that the discipline is moving forward rapidly to incorporate machine learning and data science into its toolbox – of the 28 sessions I listened to (I needed a lot of CPD! ), 9 mentioned machine learning/data science and had some advice on methods or integrating ML into actuarial practice. Another good sign is that some of the leading researchers speaking at the conference – such as Paul Embrechts and Mario Wüthrich – provided their (positive) thoughts on integrating ML and data science into actuarial science. The actuarial world is moving forward rapidly and I think the prospects for the profession are good, if the actuarial associations around the world recognize the trends quickly and incorporate ML/data science and more into the curricula. My standout favourite session was by Mario Wüthrich (who some actuaries will recognize as one of the co-authors of the Merz-Wüthrich one year reserve risk formula), who presented on his paper “Neural networks applied to Chain-ladder reserving”, available on SSRN. Besides for the new method he suggests, which I think is one of the best solutions when an actuary needs to reserve for IBNR by sub-category (such as LOB/injury code etc), I found the perspectives on ML that he interspersed his talk with fascinating, an example of which is connecting neural networks to Hilbert’s 13th problem. One point made was that the new claims of algorithms potentially reserving with much less uncertainty than the chain-ladder need to be treated with caution until the issue of model risk is dealt with, and the underlying assumptions brought out into the open. A brilliant session was given by Paul Glasserman on “Robust model risk assessment” (the paper is ungated if you google it). At the heart of the idea is that model risk could be defined as an alternative probability measure (i.e. if the model generates a baseline probability distribution on a random variable of interest, then model risk could arise if in fact the RV followed a different probability distribution) attached to the simulations presented by a stochastic model (instead of an issue with the model parameters or structure). With this idea in hand, the presentation carried on to show how to find the maximally damaging alternative probability measure for a given level of model risk, as measured by the relative entropy between the baseline and alternative models. The major benefit for actuaries is that this is simple to implement in practice and gives rise to some interesting insights into what can go wrong with a model. Another session that stood out for me is Pietro Parodi and Peter Watson’s session ”Property Graphs: A Statistical Model for Fire Losses Based on Graph Theory”. The idea here is to find a model that helps to explain why commercial property follows the heavy tail severity distributions observed in practice. Often, in practice, algorithms/distributions are applied because they work and not because there is a good logical basis based on first principles. Along these lines, I am reminded of some of the work of Perks/Beard who proposed first principle models to explain their mortality laws (my small contribution along these lines is an explanation of the chain-ladder algorithm as a life-table estimator, on this blog). Parodi and Watson use graph theory to represent properties (houses/factories etc) and define statistical models on the graph of fire events. These models lead, after simulation and in aggregate, to curves defining the overall severity of a fire event that are not radically different from the current set of curves used by actuaries. Paul Embrecht’s sessions were amazing to listen to, because of his ability to tie together so many disparate strands in actuarial science and quantitative risk management. It was particularly meaningful to see Paul, who is close to retirement, show-casing some of the work of Mario Wüthrich on telematics on stage, and providing his view that the novel application of data science, as embodied by the work on telematics, is a direction for the discipline to take. I also enjoyed Hansjörg Albrecher’s session “Flood risk modelling” which was a tour-de-force of various statistical modelling techniques applied to some novel data. “Data based storm modelling” – this was a demonstration of how a storm model was built for Germany by a medium size consulting firm. I liked the application of mathematics (Delauney triangulation for mapping the wind events and Singular Value Decomposition for dimensionality reduction) to a relatively big data problem (40m records). “Using Risk Factors in Insurance Analytics: Data Driven Strategies” – how to apply GLMs to sparse and high-dimensional data without breaking the linearity assumptions. “Trend in Marine Insurance” – a great overview of this specialty line. I am not sure if access to the VICA is still open, but if you have any interest in the topics above, I would strongly recommend you try and view some of the sessions. Naked – South Africa’s Lemonade? A start-up that I’ve been excited to watch for a while now – enigmatically called Naked – launched their product to market late last week. Naked offers car insurance over an app with quote and bind functionality. This post is going to discuss my thoughts on their offering, draw a parallel to the well-known Lemonade start-up in the USA and briefly touch on my experience with the app (spoiler – good price and fun experience). The policy on offer is primarily Car insurance (Auto), plus a couple of extras (wheels, lights etc) over an app using a chatbot instead of traditional forms. A neat feature is a pause in accident coverage when your car is stationary, leaving only the flood, theft, fire and other relevant perils on the policy. Anyone following the Insurtech scene will notice that this setup is very similar to Lemonade, which is a licensed insurer in the USA offering Renters and Homeowners insurance. Some of the similarities are using a chatbot instead of traditional forms, the fixed fee for expenses and profit, leaving a pot behind for claims, and the extra funds in the pot going to a charitable cause as a Giveback (Lemonade seems to have come up with this terminology). Some of the differences are that Lemonade is an insurance company and could participate in underwriting profit and loss if they wanted, Lemonade seems to have allowed themselves more discretion as to when they “Giveback” (Board needs to approve, they build up a rainy-day fund etc) and Lemonade pushed an emphasis on data science and behavioural economists, whereas Naked discusses their “AI” technology which they hope will bring down costs. Using the app is a pleasant and short experience, with an emphasis on ease of use and quickly speeding you along the process. I was pleasantly surprised that the pricing is actually quite reasonable on the vehicle I chose to request a quote for (which is the same vehicle I tried to insure online a few weeks ago and discussed in this post). To actually get the cover, one takes a few photos of your vehicle, and I wonder what exactly the process is on the back-end after that – are these just used at the claims stage or is there something else happening here (deep learning pre-inspection maybe )? The only point that left me wondering a little bit is a particular claim made on the Naked website when it is explained that A “… flat fee means that our income doesn’t depend on how much we pay out in claims, so we have no reason to make claiming difficult.” I don’t think this is entirely true, despite the claim to the contrary – at the end of the day, if there are claims greater than 80% of written premium, someone will need to foot the bill, whether the insurer or the reinsurers. Therefore, claims will still need to be managed carefully to avoid upsetting these parties (insurer and reinsurers), and claims overruns of the 80% in the pot for an extended period of time will mean prices will need to go up. So I don’t think this has solved the “the age-old cycle of distrust between insurers and their customers” as neatly as one might think from the website. As a conclusion, it is exciting to see a well-built startup bring an innovative insurance business model to South African shores! Author RonrichPosted on April 15, 2018 Categories UncategorizedLeave a comment on Naked – South Africa’s Lemonade? I recently tried to obtain a quote for comprehensive motor insurance from a price comparison website. The quote was on an older car, worth approximately R70k. After asking for some of my details, the comparison website presented me with something quite similar the following table of premiums and excesses. Note that these are not the actual premiums and excesses quoted (due to copyright issues) but are modified by adding a normal random variable and then rounding the excesses. I don’t think these changes distort the economic reality of what I was quoted, but, nonetheless, these are not the actual numbers. Most of the policies presented had similar terms and conditions – some sort of cashback benefit, hail cover and car rental. The distinguishing features seemed to be premium and excess. However, as a consumer, in this case, I found it difficult to compare these premiums, except for those with a R4.58k excess. What is a good deal and which of these is more overpriced? It makes some sense that policy number 9 is overpriced – I can get a lower excess for a lower premium, so this policy is definitely sub-optimal. But what about policy 8 – this has a low excess, but seems very expensive compared to the policies with only a slightly higher excess. Is this reasonable? Intuitively, and having some idea how motor policies are priced, my answer is no, but can we show this from the numbers presented? Before getting into the details of how I tried to work with these numbers, I think it is important to stop and consider the public interest. Would the general consumer of insurance have any idea how to compare these different premiums given the different excesses? Probably not, in my opinion, leading to the title of this post. I guess that some rational consumers would be ‘herded’ into comparing policies 4-7, since they have the same excess, and maybe go for the cheapest one of those. But this is perhaps only a “local minimum” – maybe, in fact, one of the other policies offers better value. Also, one has to rely on the good faith of those running the comparison website to present policies with only the same terms and conditions, or else this supposedly rational strategy might backfire if policy number 4 has worse terms. Lastly, this all makes sense on day one – what will the insurer offering such a generous premium do over the lifetime of the policy – will they keep being so generous or will the consumer be horrified after a couple of steep price hikes. Hence, this set of quotes seems to me a “comparison of apples with oranges”. Note that code is under the open-source MIT License, so please read that if you want to use it! Of course, if we had access to the pricing models underlying these premiums then it would be a simple matter to work out what is expensive and what is not, but the companies quoting were not so kind as to share these and only provided these point estimates. I have some ideas about the frequency of occurrence of motor claims and the average cost per claim, so ideally I would want to incorporate this information into whatever calculations I perform, pointing to the need for some sort of Bayesian approach to the problem. However, the issue here is that the price of a general non-Life/P&C policy is really the outcome of a complicated mathematical function – the collective risk process – often represented by a compound Poisson distribution, which, to my knowledge, does not have an explicit likelihood function (which is why, in practice, actuaries will use Monte Carlo simulation or other approaches like the Panjer approximation or the Fast Fourier Transform to simulate from the distribution). Since most Bayesian techniques require an explicit likelihood function (or the ability to decompose the likelihood function into a bunch of simpler distributions), it would therefore be difficult to build a Bayesian model with standard methods like Markov Chain Monte Carlo (MCMC). Prior information on the problem at hand is encoded in a statistical distribution for the parameters we are interested in. 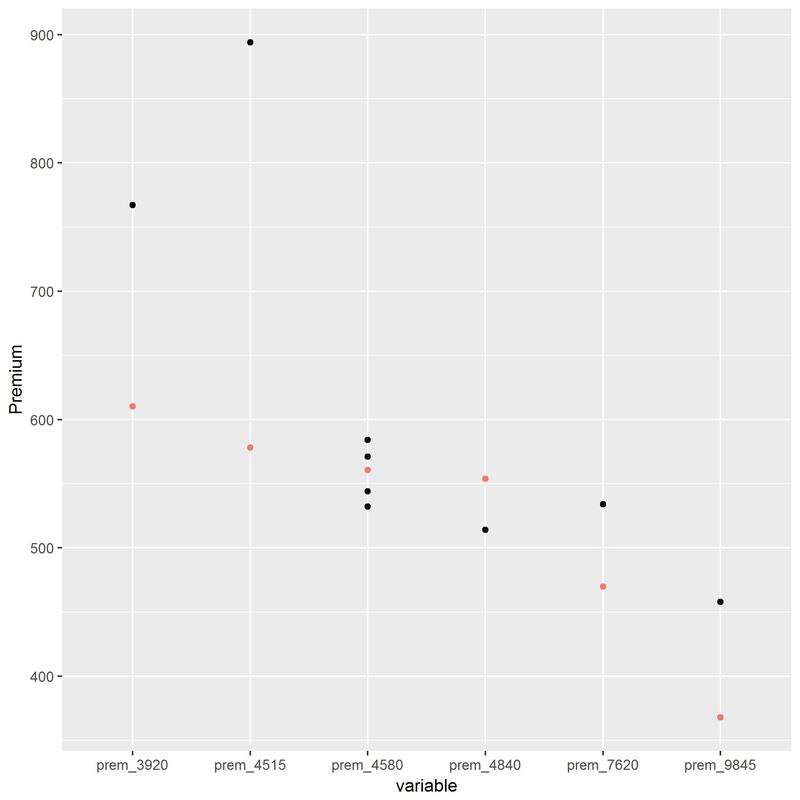 For example, the average cost per claim might be distributed as a Gamma distribution. The data likelihood is then calculated based on a realization of the parameters from the prior distribution. The likelihood of a set of parameters is then assessed as the product of a) the likelihood of getting that parameter set multiplied with b) the data likelihood divided by c) the total probability of all parameter sets and data likelihoods. In this case, the data likelihood is not available easily. The basic idea of ABC is that in models with an intractable likelihood function, one can use a different method of ascertaining whether or not a parameter set is “likely” or not. That is, by generating data based on the prior distribution and comparing how “close” this generated data is to the actual data, one can get a feel for which parts of the prior distribution make sense in the context of the data, and which do not. I selected the parameters of the Beta distribution to produce a mean frequency of .25 (i.e. a claim every four years) with a standard deviation of .075.
with the parameters of the gamma chosen so that the average cost per claim is R20k with a standard deviation of R2.5k and the standard deviation of the cost per claim is R10k with a standard deviation of R2.5k. Lastly, I assumed that the insurers are working to a target loss ratio of 70% (i.e. for every 70c of claims paid, the insurers will bring in R1 of income), with a standard deviation of 2.5%. This distribution also followed a beta, similar to the frequency rate. So far we have generated lots of data from our priors. Now it is time to see which of the parameter combinations actually produce premiums reasonably in line with the quotes on the website. To simplify things, I put each of the simulated parameters into one of nine “buckets” depending on the percentile of the parameter within its prior distribution. And for the very last step, the median distance between the generated and quoted premiums was found for each parameter bucket. I only selected those “buckets” which produced a median distance of less than 8%. The median was used, instead of the mean, since I believe that some of the quotes are actually unreasonable, and I do not want to move the posterior distance too much in their favour by using a distance metric that is sensitive to outliers. Some observations are that the prices I was quoted implies both a frequency and severity of claims that are a little bit higher than I assumed, but with a lower average cost per claim. The standard deviation of the average cost per claim is lower as well, with less weight given to the tails than I had assumed. Lastly, the loss ratio distribution matches the prior quite well. Lastly, the implied prices are shown in red the next image. Bearing in mind that this is all based on the assumption of actuarially unfair premiums – in other words, allowing the insurer to add a substantial profit to the actual risk premium by targeting a loss ratio of 70% – only three of the quotes are reasonable (two of those with an excess of R4.58k and the one with an excess of R4.84k). The rest of the quotes are significantly higher than can be justified by my priors on the key elements of the claims process, and it would seem irrational for a consumer with similar priors to take out one of these policies. 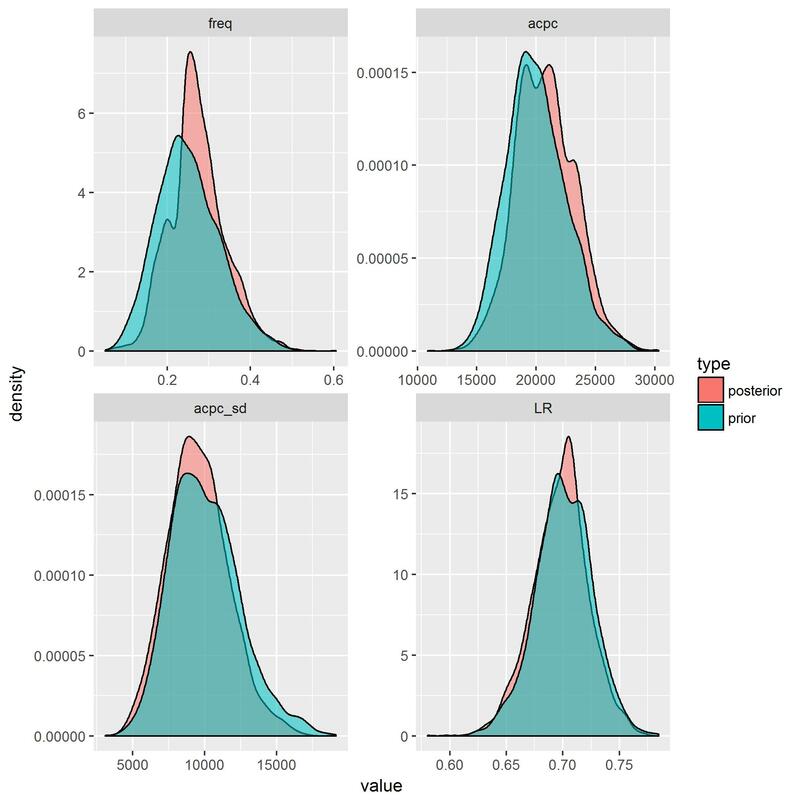 This post showed how it is possible to back out the parameters that underlie an insurance quote using prior information and Approximate Bayesian Computation. Based on the analysis, we can go back to the original question I asked at the beginning of the post – is the low excess policy number 8 priced reasonably? The answer, based on my priors, seems to be “no”, and the excesses quoted here do not seem to be all that useful when it comes to explaining the prices of each quote. What could be modelled more accurately? Some of the policies include a cashback, which we could priced explicitly using the posterior parameter distributions, but I personally attach very little utility to cashback benefits and would not pay more for one. So this is a more minor limitation, in my opinion. During the last few years of my career I have had the opportunity to work in two of the major fields of practice for actuaries – life insurance and non-life insurance. Something that always bothered me is that actuaries who perform reserving work in either of these two areas use totally different techniques from each other. Life actuaries will generally build cash-flow models to project out expected income and outgo to derive the expected profit for each policy they are called on to reserve for, which is then discounted back to produce the reserve amount. One of the key inputs into this type of reserving model is a life table which tabulates mortality rates which apply to the insured population that is being reserved for. Non-life actuaries, on the other hand, almost never build cash-flow models, but will apply a range of techniques to past claims information (arranged into a “triangle”, see later in the post for a famous example) to derive expected claims amounts that are held as an incurred but not reported reserve (IBNR). Some of these techniques are the chain-ladder, the Bornhuetter-Ferguson (Bornhuetter and Ferguson 1973) and Cape-Cod techniques (Bühlmann and Straub 1983). Lifetables are never considered. It would make sense intuitively that there is some connection between these two “tribes” of actuaries who, after all, are both trying to do the same things, but for different types of company – make sure that the companies have enough funds held back to fund claims payments. This post tries to illustrate that in fact, hidden away in the chain-ladder method, there is an implicit life table calculation and that IBNR calculations can be cast in a life table setup. The key idea was actually expressed in a paper I wrote for the 2016 ASSA convention with Professor Rob Dorrington and appeared as an appendix in the paper. Something else that the idea helps with is that it provides an explanation why the chain-ladder is so popular and seems to work well. The chain-ladder method remains the most popular choice of method for actuaries reserving for short term insurance liabilities globally and in South Africa (Dal Moro, Cuypers and Miehe 2016). Although stochastic models have been proposed for the chain-ladder method by Mack (1993) and Renshaw and Verrall (1998), the underlying chain-ladder algorithm is still described in the literature as an heuristic, see for example Frees, Derrig and Meyers (2014). The simple explanation for the success of the chain-ladder method is that underlying the estimates of reserves produced by the chain-ladder method is a life table and that the chain-ladder method is actually a type of life-table estimator. The rest of the post shows the simple maths and some R code to “pull out” a life table for the chain-ladder calculation. In a future post, I hope to discuss some other helpful intuitions that can be built once the basic idea is established. where f is the so called loss development factor in development period j. This is shown in the next table and plot, followed by the R code to produce the numbers. When will the above calculations work well? These calculations make sense when dealing with triangles that increase monotonically i.e. do not allow for over-reserving or salvage and recoveries. A good example is on count triangles of paid claims. Now that we have shown that the chain-ladder estimates a lifetable, the question is whether this is just an interesting idea that lets one connect two diverse areas of actuarial practice, or if any significant insights with practical implications can be derived. That will be the subject of the next post. Dal Moro, E., F. Cuypers and P. Miehe. 2016. Non-life Reserving Practices. ASTIN. Frees, E.W., R.A. Derrig and G. Meyers. 2014. “Predictive Modeling in Actuarial Science”, Predictive Modeling Applications in Actuarial Science 1:1. Mack, T. 1993. “Distribution-free calculation of the standard error of chain-ladder reserve estimates”, Astin Bulletin 23(02):213-225. Renshaw, A.E. and R.J. Verrall. 1998. “A stochastic model underlying the chain-ladder technique”, British Actuarial Journal 4(4):903-923.